Last week, the Energy Club project – an out-of-school-hours physical activity programme created in partnership with Torriano Primary School, Jubilee Hall Trust and Camden Council – won the Successful Partnership Award at the 2017 Sporta Awards. We are extremely proud to see that the hard work of all involved has been recognised as a sustainable example of how schools, trusts, and councils can work together to get more children more active. An off-shoot of the larger Camden Active Spaces project, the Club was designed to “activate” the newly constructed school playgrounds. Our aim was to create programming to maximise community utilisation of the spaces. The Trust initially provided staffing, marketing, logistics and part funding for the programme and has since up-skilled teachers and school staff to allow the programme to carry on independently. During school holidays, the school’s playground is open to the community with playworkers facilitating free activity sessions for approximately 150 children over the summer. Additionally, the playground is now opened after school hours during term time for families to use, and a free weekly Energy Club provides 30 children with facilitated playground games after school. The project also up-skilled teachers at 5 local schools, encouraging opportunities for more active play in and out of classrooms and beyond the Active Space at Torriano Primary School. We are especially proud that the project reached beyond the school community, and children from 10 other schools around Camden participated in the summer scheme. The staff training was also provided to 5 other primary schools as a part of the project. The Club ran in 2015 and 2016, and despite construction work on the playground scheduled for this summer, we are hopeful that we will be able to offer the Club at an alternative location this summer as well. The Energy Club project arose out of Camden Council’s Camden Active Spaces project. Camden has one of the worst obesity rates in London, with one in three 10 year olds in the borough being overweight or obese. 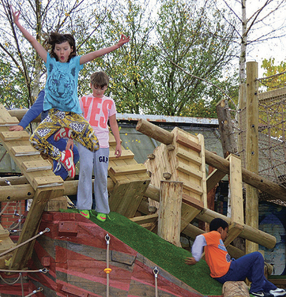 The Camden Active Spaces project commissioned original, imaginative, challenging and never-before-seen structures in the playgrounds of seven schools with the aim to increase physical activity in areas of the borough with highest need. The schools were identified by Camden Council after careful consideration of a number of factors including childhood obesity levels and proximity to quality play spaces and green space. The Active Spaces were designed in consultation with pupils, teachers and parents and led by two award-winning professional design firms. Community input was considered a core element to designing the spaces; pupils were asked about their favourite type of play and invited to draw pictures of things they’d like to see in their new Active Space. Drop-in consultation and engagement workshops were also held for parents and members of the local community to solicit a wide range of insight. See feedback from schools six months on.